When you travel, you have a choice: You can be a tourist and have a nice time, or you can be a traveler and change your life. Why Travel Matters is for those who want to change their lives. 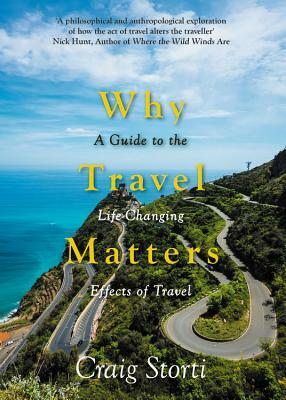 Why Travel Matters explores the profound life lessons that await anyone who wishes to learn what travel has to teach. With engaging prose, delightful wit and a distinctive style, Craig Storti infuses his own experiences traveling the world for 30-plus years with quotations, insights, reflections and commentary from famous travelers, great travel writers, historians and literary masters. Storti's vast knowledge of the literature makes him an expert curator of astute gems from the likes of St. Augustine, Mark Twain, Somerset Maugham, D. H. Lawrence, Bruce Chatwin, Aldous Huxley and more. Craig Storti is an expert on cultural communication with over thirty-years experience helping business people, diplomats, civil servants, and foreign aid workers engage effectively with people from other cultures and diverse backgrounds. He leads cross-cultural workshops for international agencies and organizations on four continents, and assists numerous corporations and government agencies to better manage global teams and culturally diverse workforces. He has lived nearly a quarter of his life abroad-with extended stays in Muslim, Hindu, and Buddhist cultures-he speaks French, Arabic, and Nepali.